President Obama announced an economy-wide target to cut greenhouse gas emissions between 26 to 28 percent below 2005 levels by 2025 and to make best efforts to reduce its emissions by 28 percent. President Xi said China intends to achieve the peaking of CO2 emissions around 2030 and to make best efforts to peak early and intends to increase the share of non-fossil fuels in primary energy consumption to around 20 percent by 2030. The two leaders reaffirmed the importance of strengthening bilateral cooperation on climate change and pledged to work together, and with other countries, to adopt a protocol, another legal instrument or an agreed outcome with legal force under the UN Framework Convention on Climate Change, UNFCCC, that is applicable to all Parties at the UN climate conference in Paris in 2015. Currently, 195 governments are Parties to the Climate Change Convention and 192 are Parties to the Kyoto Protocol, which the new global agreement is intended to replace. UNFCCC Executive Secretary Christiana Figueres called the China-U.S. announcement “clear leadership” ahead of this year’s UN climate conference set for Lima, Peru December 1-12. Governments are expected to agree on a draft global agreement in Lima that can be finalized in Paris in 2015. The two Presidents resolved to work closely together over the next year to address major impediments to reaching a successful global climate agreement in Paris. “Tackling climate change will also strengthen national and international security,” they said. The two leaders see a brighter economic future by supporting the technological innovation behind new zero and low-carbon technologies and enhancing the capacity of countries to reduce their emissions. 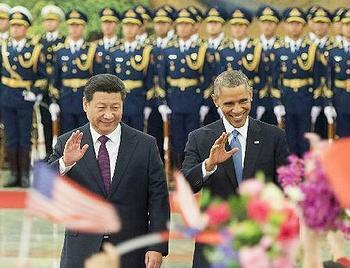 The United States and China are two of the world’s largest investors in clean energy and already have a robust program of energy technology cooperation. 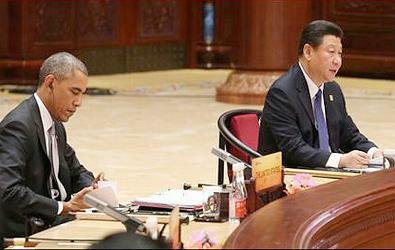 Environmental groups are encouraged by the U.S.-China announcement. “It’s a new day to have the leaders of the U.S. and China stand shoulder-to-shoulder and make significant commitments to curb their country’s emissions. They have both clearly acknowledged the mounting threat of climate change and the urgency of action,” said Andrew Steer, president and CEO of the World Resources Institute, a research organization based in Washington, DC. Steer said the U.S. target shows a serious commitment to action and puts the U.S. on a path to reduce its emissions around 80 percent by mid-century. * – agreed to work together towards the global phase down of hydrofluorocarbons (HFCs), very potent greenhouse gases used as refrigerants. The two sides will enhance bilateral cooperation to begin phasing down the use of HFCs. * – agreed on a joint peer review of inefficient fossil fuel subsidies under the G-20. The two leaders said they intend to continue strengthening their policy dialogue and practical cooperation, including cooperation on advanced coal technologies, nuclear energy, shale gas and renewable energy, which will help optimize the energy mix and reduce emissions, including from coal, in both countries. Today the two sides announced additional measures to strengthen and expand their cooperation, using the existing vehicles – the U.S.-China Climate Change Working Group, the U.S.-China Clean Energy Research Center and the U.S.-China Strategic and Economic Dialogue. * – Expanding Joint Clean Energy Research and Development: A renewed commitment to the U.S.-China Clean Energy Research Center, including continued funding for three existing tracks on building efficiency, clean vehicles and advanced coal technology and launching a new track on the energy-water nexus. * – Advancing Major Carbon Capture, Utilization and Storage Demonstrations: Establishment of a major new carbon storage project based in China through an international public-private consortium led by the United States and China to intensively study and monitor carbon storage using industrial CO2 and also work together on a new Enhanced Water Recovery pilot project to produce fresh water from CO2 injection into deep saline aquifers. * – Launching a Climate-Smart/Low-Carbon Cities Initiative: In response to growing urbanization and increasingly significant greenhouse gas emissions from cities and recognizing the potential for local leaders to undertake significant climate action, the United States and China will establish a new initiative on Climate-Smart/Low-Carbon Cities under the U.S.-China Climate Change Working Group. As a first step, the United States and China will convene a Climate-Smart/ Low-Carbon Cities Summit where leading cities from both countries will share best practices, set new goals and celebrate city-level leadership in reducing carbon emissions and building resilience. * – Promoting Trade in Green Goods: Encouraging bilateral trade in sustainable environmental goods and clean energy technologies, including through a U.S. trade mission led by Secretaries Moniz and Pritzker in April 2015 that will focus on smart low-carbon cities and smart low-carbon growth technologies. * – Demonstrating Clean Energy on the Ground: Additional pilot programs, feasibility studies and other collaborative projects in the areas of building efficiency, boiler efficiency, solar energy and smart grids.